The Apricot Appeal background paper on this card and the Brocade Blue stripe are from a 6" paper pack that was one of the hostess gifts a catalog or two ago. I first selected one of these packs as an alternative to the stamp sets being offered. I have since collected 3 different ones and I use them all the time. 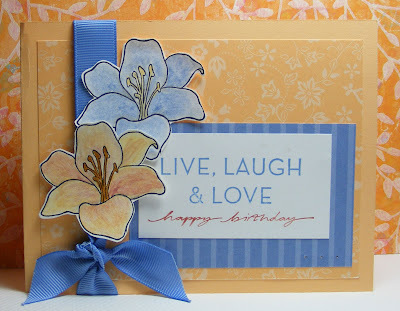 I love the visual dimension tone-on-tone papers give to a card or scrapbook page. When I get one of these packs, I write the Stampin' Up! color names on the back for easy reference. Happy Birthday this week to my upline, Jean! Oh my gosh this is BEAUTIFUL!! LOVE how you have cutout and placed the flowers along the ribbon while framing/accenting the sentiment. GORGEOUS! !